Only weeks ago it would have seemed fanciful to draw a link between the fate of an American pastor in Turkey, a crisis between two NATO allies and turmoil on global financial markets. 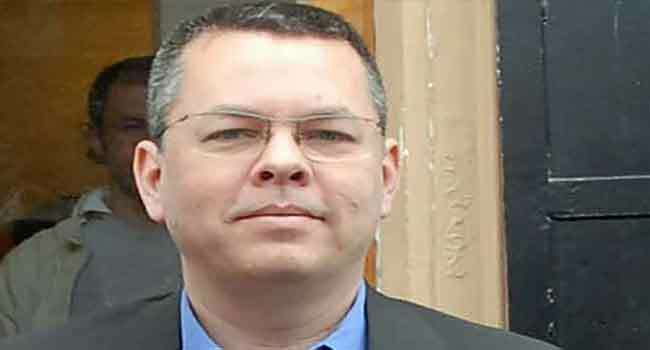 But Andrew Brunson, a Protestant clergyman who had lived in Turkey for a quarter of a century without disturbance, is now at the centre of a bitter row pitting Washington against Ankara that caused the lira to crash and the economic jitters to spread globally. Brunson’s world was turned upside down on October 7, 2016 when he and his wife Norine were arrested in a government crackdown following a failed coup bid in July that year aimed at toppling President Recep Tayyip Erdogan. Norine was released two weeks later but Brunson was kept in jail and then charged with assisting two organisations regarded by Turkey as terror groups: the group of Fethullah Gulen blamed for the putsch and the outlawed Kurdistan Workers Party (PKK). Brunson, who marked his 50th birthday behind bars on January 3, faces 35 years in jail if convicted. His arrest received relatively little media coverage at the time and efforts by US officials to release him were given initially only a very low profile in public. But his continued detention for almost two years — without being convicted — has turned into one of the biggest bones of contention in the increasingly troubled relationship between Turkey and the United States. The tensions reached a new peak last week when President Donald Trump announced trade sanctions against Ankara, sending the lira into a tailspin and raising fears of a full-blown economic crisis. Brunson’s Evangelical Presbyterian Church describes him as a “teaching elder” who moved to Turkey in 1993 as part of a missionary programme. According to his own testimony, Brunson arrived in the Aegean city of Izmir in 2000 and opened his Dirilis (Resurrection) Church a decade later. A small, easily missed building, it counted just a few dozen congregants. “I was not engaged in any secret activity. The state always watched us,” he said in court. Brunson was sent from jail to house arrest last month but the move added to rather than defused tensions, with US officials bitterly disappointed he had not been allowed to return home. American reports alleged that Turkey had reneged on an agreement, although this has been vehemently denied by Ankara. A court Wednesday again rejected a request brought by Brunson’s defence for his release, leaving no end to the crisis in sight. In theory, Brunson must wait until his next trial hearing on October 12. Speaking in perfect Turkish, Brunson told the court he “forgives” those who provided testimony accusing him of links with the PKK and Gulen’s group. Turkish officials insist that the case has been misportrayed in Western media and Brunson has serious charges to answer over links to the failed coup bid. “Shame on you, shame on you. You are exchanging your strategic partner in NATO for a pastor,” Erdogan told the US after the latest tensions erupted. But the US has insisted Brunson is an innocent man who is being unfairly held. Trump has repeatedly tweeted his support for Brunson, describing him as a “fine gentleman”, a “Christian leader in the United States” and a “respected US pastor” whose continued holding by Turkey was a “total disgrace”. The White House said Tuesday Trump was experiencing a “great deal of frustration” that Brunson has still not been released. The row has become symbolic of a malaise between the two nations that extends far further than this case. Turkey is furious that the US has failed to hand over Gulen to face trial and also over the conviction and imprisonment of Turkish banker Mehmet Hakan Atilla for busting US sanctions against Iran. Turkish officials have rejected claims that Ankara engaged in “hostage diplomacy” by jailing Brunson in the hope of winning US concessions elsewhere. Yet last September, Erdogan suggested that Turkey could free Brunson if Washington handed over Gulen, who lives in self-imposed exile in Pennsylvania. “They say ‘give us the pastor’. You have a preacher (Gulen) there. Give him to us, and we will try (Brunson) and give him back,” Erdogan said.